Every Serra Hinzman Soap bar recipe is created to enrich the user’s well-being. To achieve that goal, each bar is made with the freshest, highest quality non-GMO, organic and natural ingredients. ﻿Our very own creamy goat milk is the cornerstone of each recipe, filling our soap bars with the highest percentage of milk possible. We own, breed and raise a beloved herd of Nigerian Dwarf goats in west-central Georgia on our farm, Hooah Hill. We pamper and cater to the needs of each pregnant and milking doe (mom) by managing their non-GMO diet, ultimately giving us the safest, healthiest and highest quality milk possible. Goat milk at its essence is beneficial to the skin. The high levels of alpha-hydroxy acids in the milk dislodges the adhesive that binds dead skin cells, leaving behind the young cells. The ultimate result is smooth, soft skin. Additionally, goat milk is a natural protectorate. Its anti-bacterial properties inhibit the growth of microbial organisms to help fight against invading bacteria that promote acne. The anti-inflammatory triglycerides in goat milk also wage battle against dry, damaged skin, leaving it soothed and moisturized. 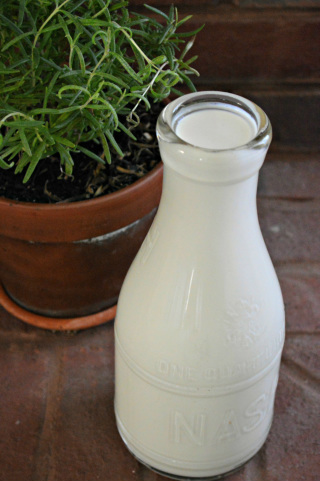 Goat milk is particularly high in vitamin A, the vitamin responsible for repairing damaged skin. And Vitamins D, C, B1, B6, B12 and E are found a-plenty in goat milk! The therapeutic properties of goat milk have been embraced for centuries. In fact, even Cleopatra submerged her entire body in a bath of the soothing white elixir. So why not us?! A plethora of organic and non-GMO pure and fabulous fatty-fat fats are specially chosen for each bar to ensure a luxuriously healthy cleansing experience. Our research has unearthed lucrative oils with a proven history, like Argan, Sea Buckthorn, Baobab, Tamanu and Maracuja oils - each has been specifically selected to accompany our goat milk soap recipes. Spices and herbs are chosen for their healthful properties and we are always especially excited when we are able to include our freshly harvested and dehydrated organic plants from our very own gardens! We try to take every opportunity to infuse natural elements such as organic citrus peels or herbs when we warm our organic and non-GMO oils. No saponification – no soap! All soap has a necessary ingredient – lye (Sodium Hydroxide). We use food-grade lye in our soap making. Chemistry 101 taught us mixing a base (lye) with an acid (fat/oil) results in a neutral (mild, gentle soap) consequently leaving no lye in the final, cured soap. A glorious result of this reaction is the formation of the natural humectant, glycerin. Unlike commercial soap makers, who remove the glycerin so they may sell it separately as a special (luxury) product, we leave it right where it belongs…in our bar of soap! There are things you will never find in our soap. As to not compromise the natural integrity of the soap, we made the decision to exclude fragrance oils which contain synthetic properties, artificial dyes and artificial preservatives. Our soap relies solely on natural, non-GMO and organic ingredients which tend to result in a milder scent and color. You won’t find Palm Oil or any Palm product (ie: vegetable shortening or vegetable oil) in our soap. We refuse to support the ecologically damaging practices the palm harvesting industry has on the environment, animals and social welfare of others. Even the Sustainable Palm Oil industry has been called into question by environmentalists as a "greenwashing scheme," adding that "the RSPO's ( Roundtable on Sustainable Palm Oil) standards do not ban deforestation or destruction of peatlands for the development of oil palm plantations." If we are not 100% convinced not only of the quality of an ingredient, but also how and where it is produced, it will not be allowed in our soap. Each bar of soap is visibly beautiful, but we have chosen to cover each bar in protective packaging while it is waiting for your use in order to preserve the precious properties of the oils that may be subject to the degradation of light. Just as important it is to apply natural, safe elements to your skin, we have insured the packaging that touches “the skin” of each bar of soap is not only non-threatening to the integrity of the soap’s ingredients, but also the environment. The Forest Stewardship Council (FSC) certified, unbleached Totally Chlorine-Free (TCF), recyclable parchment paper that cradles each precious bar of soap helps preserve the natural pureness of each handmade bar. Serra Hinzman Soaperie guarantees every bar of soap will be perfectly imperfect. The nicks, chips, lumps, bumps and dents add undeniable charm and character to every bar. We guarantee every bar of soap will vary in color, scent, texture and size. We guarantee every bar will weigh between 7 and 8+ ounces – unless otherwise stated. We prepare “batches” in small quantities and each bar is hand cut, weighed and inspected. Please visit the Glossary of Ingredients for a more detailed explanation.